SalesSeek will connect with your organization's Twitter and Facebook accounts to gather leads from those reaching out to you on these channels. 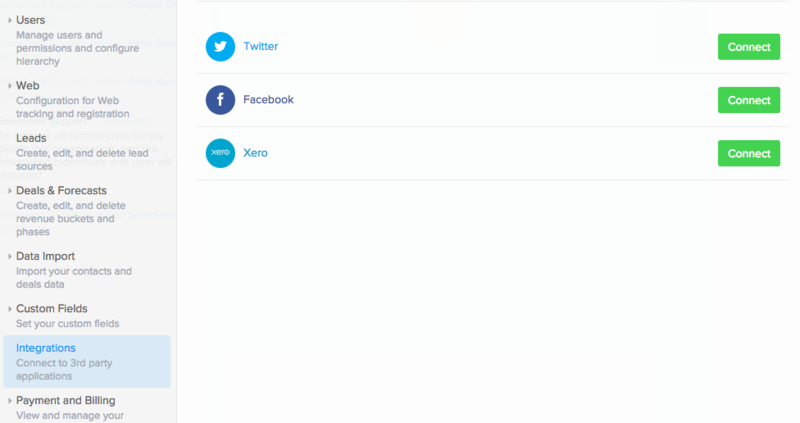 To connect SalesSeek to your organization's Twitter and Facebook accounts go to App Settings and select the Integrations section. To connect your Twitter or Facebook accounts simply click 'Connect' and you will be required to authorize SalesSeek to access your account. Once this is confirmed your Social feed will populate with information within 1 hour. Note: The authorization will pop-up in a new window so ensure that you do not have any pop-up blockers enabled in your browser.